For some people, spring weather means travelling with Kleenex at all times. Seasonal allergies can be a bear, and they don't just affect your nose and sinuses - they affect your skin, too. Below, we've explained a few skin problems that seasonal allergies can cause, so you can stay prepared, plus how to solve them. Dark circles: Seasonal allergies can mean more fluid in the veins, which shows through the skin under the eyes as dark circles. Though dark circles aren't uncomfortable, some people combat them with under-eye creams containing caffeine or cover them up with cosmetic concealers. We love Sente's Illumine Eye Cream or Colorescience Total Eye. Puffy eyes: If you're allergic to pollen or mold, your eyes may become irritated, water, and puff up in the spring. Lessen the swelling by taking antihistamines, wearing a cold compress, or (even though it's no fun) spending time indoors. 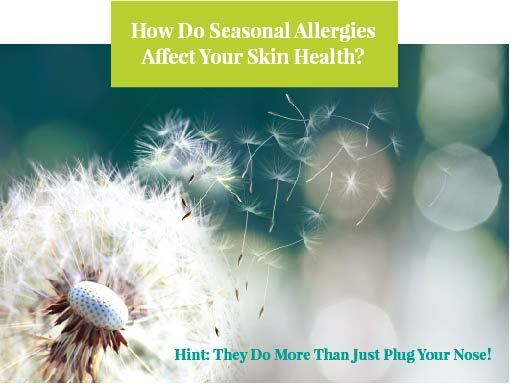 Aggravated eczema: Those with eczema are extra vulnerable to itchy, irritated skin during allergy season, and annoyingly, scratching only makes symptoms worse! We recommend that people with eczema stock up on SkinCeuticals Phyto Corrective Masque or Pomega Healing cream, which will alleviate the irritation. Red nose: Nasal congestion and sneezing are maybe the best-known allergy symptoms. Those symptoms can affect your skin, too, if you rub your runny nose, which will make the area red, flaky, and sore. To bring down the redness, choose your tissues carefully and pick a brand with added lotion or calming ingredients. Then, apply a non-irritating moisturizer to the area to soothe the inflamed skin. We recommend Calecim's Recovery Night Complex. Whatever seasonal allergy symptoms you may have, we're here to answer questions, look at anything concerning, and above all, help you live more comfortably. Enjoy the brighter days, and come see us when you need us.